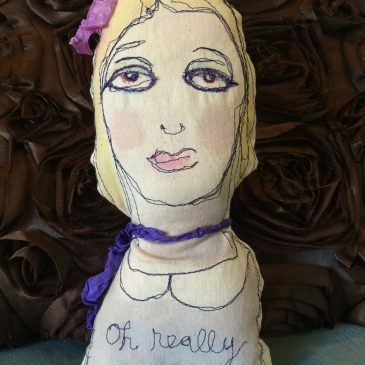 These “Oh Really Dolls” are whimsical art pillow dolls. 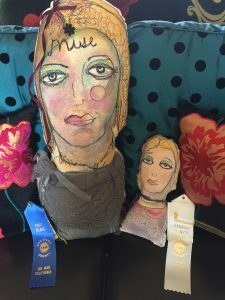 The main pillow is 9 1/2″ x 5″ x3″ and was created in 2016. Featured in Sew Sommerset 2016. 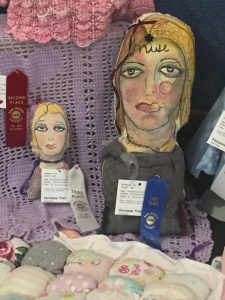 3rd Place in sewing at the San Diego County Fair in 2017. I love the unusual in art, design, people, and life, so naturally I gravitate toward free-motion stitching. 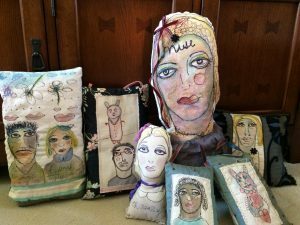 The juxtaposition of painted-fabric faces and storytelling through hand-sewn words combined with free-motion stitching embraces my light and humorous style.